from the air stream in commercial kitchen exhaust systems. When paired with optional odor control, the PCU also eliminates or reduces odor to acceptable levels. The unit is designed for use with a Grease Master high-efficiency water wash or baffle ventilator and may also be used with other high-efficiency exhaust hoods. 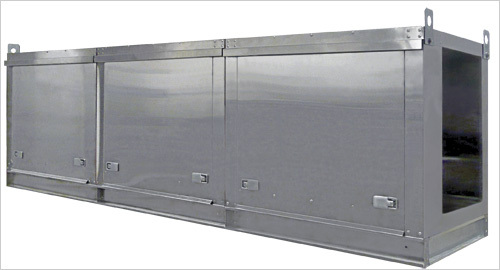 The typical PCU includes a washable steel pre-filter and disposable highefficiency (MERV 14) media filter; a HEPA final filter module is available for smoke control, and odor control is handled via an optional 50/50 blend carbon/permanganate module; sizes range in capacity up to 10,000 CFM; and the PCU is ETL listed to standard UL710 and is suitable for indoor and outdoor installations. • Pre-engineered for the most efficient, cost- effective systems. • Listed by ETL Testing Laboratories to ensure acceptance by local building officials. • Service network of over 100 factory trained representatives responding to your service needs. • One year parts warranty.ld.